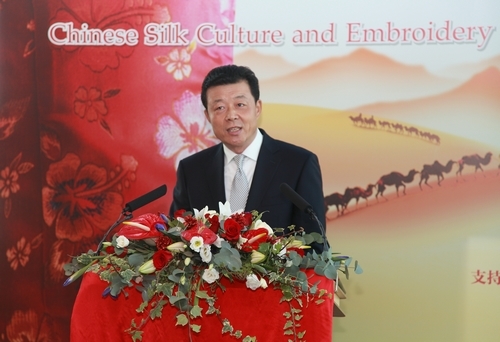 I wish to warmly welcome to London this Chinese Silk Culture and Embroidery Art Exhibition. I congratulate all the organisers and supporters of this exhibition. The exhibition has gathered a visual and cultural feast for both British and Chinese people to enjoy. We can all admire and wonder at what can be created with needle and thread. Before us are more than 150 of the finest examples of Chinese silk and embroidery work. It gives visitors a rare opportunity to experience the richness of Chinese silk and embroidery culture. · and Sichuan embroidery (Shu Xiu). In China silk and embroidery are both a handicraft and a refined art form. It has evolved to be an essential part of the Chinese culture. Some works before you now are the result of a year or even many years of meticulous crafting. As you will be able to observe these quintessential pieces are both traditional and modern. They are traditional because they have been created with the age-old weave and stitch techniques. They feature animals, flowers, tell fairy tales and folklore. They stress traditional Chinese values of harmony between humans and nature. These works are modern because they also reflect the colorful contemporary life of Chinese people along with their dreams and pursuits. These have brought this ancient art form up-to-date. Together these works present a symbol of the high arts and sophistication of Chinese culture. This exhibition speaks volumes about interaction between Chinese and Western civilizations. The recent 18th National Congress of the Communist Party of China stressed the need to carry forward fine Chinese cultural traditions. But, at the same time the Congress stressed drawing on the best of foreign cultures through cultural exchange. Silk is the earliest and most classical media for cultural exchange between China and the West. The ‘Silk Roads’ were at first overland. Later these trade routes greatly expanded in volume through maritime exchange. Whether by sea or land, trade in commodities greatly spread cultural exchange. Over thousands of years silk from China has arrived in Britain along these ‘Silk Roads’ on land or by sea. Silk became a most prized import to Europe from Roman times and right up to today in the UK. In modern times the industrial revolution that started in Britain uplifted the scale of silk production from family workshops to a modern industry. Western perspective drawing and chromatology also enriched techniques of Chinese embroidery. In the process of our cultural exchanges Chinese embroidery artists have been inspired by Western painting. The result is that they have diversified the style of their works. This has challenged them and the result has been the recreation of some European masterpieces. You will find in the exhibition some embroidery modeled after paintings by Monet and Jacapo Foschi. Instead of brush and paint Chinese artists have attained a new artistic peak with needle and silk thread. These ingenious works retain the same special impact of the paintings but at the same time enhancing the unique beauty of embroidery. The most luxurious and elaborate of all silk products is brocade. In Chinese culture brocade is often synonymous to something flourishing and prosperous. So I wish the exhibition a great success. I wish China-UK relations a future as bright as shining brocade!